If you have ever wondered how to make homemade chocolate syrup (like the kind in a bottle used to make chocolate milk or top ice cream) – I have a recipe for you! This is so simple and versatile, you’ll wonder why you never made it before! The uses are endless – chocolate milk, hot cocoa, ice cream topping, and my personal favorite…Frozen Coffee! Mix all ingredients together in a small saucepan. Bring to a boil and continue cooking for 3 – 4 minutes – whisking constantly. Let cool. Syrup will thicken as it cools and will keep in the refrigerator for 2 – 3 weeks, or at room temperature for 2 – 3 days. To soften refrigerated syrup, heat on the stove or microwave. To make chocolate milk or hot cocoa: For each 8 ounces of cocoa (or chocolate milk) add 2 tablespoons homemade chocolate syrup to 3/4 cup of milk. For the hot cocoa, heat thoroughly – for the chocolate milk, stir well. Place all ingredients in a blender and blend thoroughly. Serve and top with whipped cream if desired. The total cost to make 1 cup of homemade chocolate syrup is $1.16 – I think that’s a pretty good deal for something so delicious! What are your favorite homemade beverages? I’d love to hear from you! that’s all it takes for a chocolate syrup? mmm… something tells me I’ll be having an homemade iced flavoured latte pretty soon! That’s all it takes! You will love it! I was thinking it would be more complicated too! It’s pretty close to that here in PA – hazy, hot and humid! 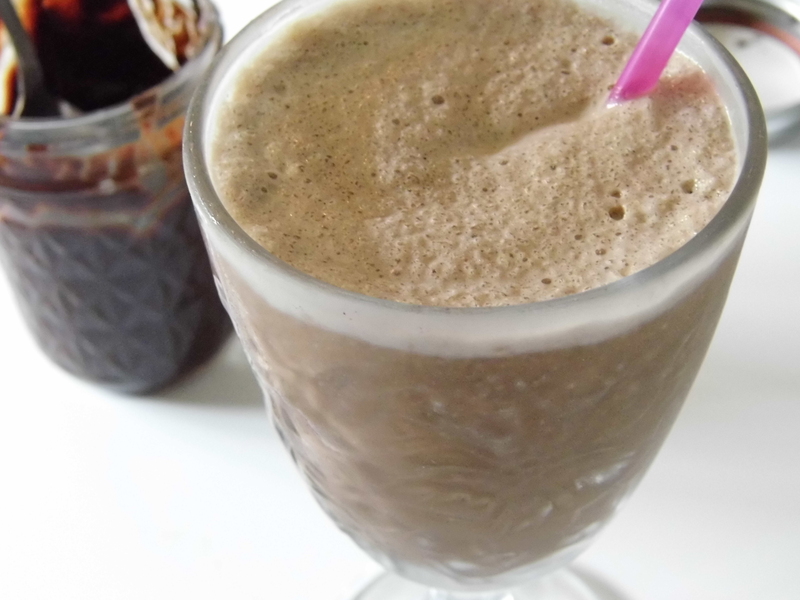 I can’t stop making the frozen coffee – it hits the spot in weather like this! Yup. It’s like that for us. Plus thunderstorms. Frozen coffee sounds just the thing for weather like this! The chocolate syrup looks lovely, I too thought it would be more complicated! I will definitely be trying the recipe out. It’s super easy – I love keeping some on hand…especially during the hot weather because frozen coffee is one of my favorite drinks! I love how easy this is! The ingredients in homemade chocolate syrup can be so icky sometimes. So Yum! I can’t stop making them! You are so welcome! I’d love to hear how it works with Splenda – lots of people in my family would prefer I use it! Sure! It’s about that temperature where I am too – I’ve been making them left and right! Amazing idea! And with the hot weather going strong, I’m definitely trying this on for size soon. Thanks! I’d love to hear how you like it! I’m with you – the less processed foods, the better. The frozen coffee….incredible! I wasn’t real crazy about it until I started making my own – I can make it exactly how I like it! It’s so yummy! I’d love to hear what he thinks about it! Yum. Hope it’s sunny tomorrow so I can hang out in the backyard with one of those. Thanks! Sure! It’s a fantastic drink – perfect for summer! I’ll definitely be making frozen coffee again. It is much less expensive – I love when I can make something taste better for cheaper! Oh wow this is great! Thank you for sharing the recipe. For some reason I can never seem to find chocolate syrup around where we live. It’ll be brilliant to be able to make our own! It’s so much tastier to make your own too! I agree, it’s my new addiction! Thank you so much for the sweet comment! You have a wonderful blog, with really great recipes! I really enjoyed checking it out! These could definitely become addictive! Sounds really good! I will give it a try. The frozen coffee is crazy good! Frozen coffee ice cubes — genius! Isn’t it amazing how the simple things are so clever?? Yes! The best ideas are the simplest ones! Here’s a question: I have seen other chocolate syrup recipes that call for corn syrup. While I’d like to make some of my own ingredients, it seemed like a waste of time to make it just to keep the HFCS in there. How does this recipe compare to store-bought syrups (especially Hershey’s)? The taste is better, but the consistency is thicker. You will need to warm it up a bit to get it pourable. I use this recipe specifically for frozen coffee and hot cocoa. We don’t drink a lot of chocolate milk in my house. For ice cream toppers, I use a separate hot fudge sauce. If you want it thinner, you could probably add in more water or maybe some milk – but I haven’t tried that. I have been wanting to post on how to make home-made chocolate syrup for a while but have yet to get around to it. (My list is always growing). Thanks for adding this!!! This frozen coffee looks exactly what I’ve been looking for in the warmer weather – think I’ll have to give this a go later in the week, especially the chocolate syrup – that’s such a revelation that I could make it myself! I’d love to hear what you think of it! I have become quite addicted to the frozen coffee – it’s my new “go to” drink each afternoon and anytime someone stops by my home! It might be good, but I usually like my coffee hot. Call me old fashioned. Thanks for the visit.